Last Saturday my husband and I attended a wonderful performance of Around the World in 80 Days, based on the book by Jules Verne at the Village Theater in Everett. It was amazing. With only five performers portraying 39 characters, we were transported to exotic locales and entertained by fabulous stunts. 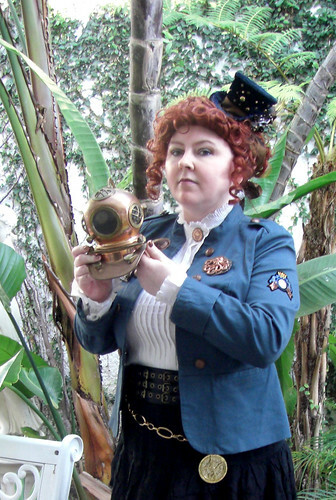 It is a must see for any steampunk enthusiast. After the show we were invited back to meet the actors and take a few pictures. The female lead, Aneesh Sheth (Aouda & others) is as lovely up close as she was on stage. Jared Michael Brown (Philleas Fog) is much more approachable than his character and mugged for the camera. Unfortunately, my camera was not up to the task, but you can see the rest of the blurry evidence here. The show runs through March 29th and I highly encourage you all to see it if you can. Show the world that we want more of this type of Victorian adventure! 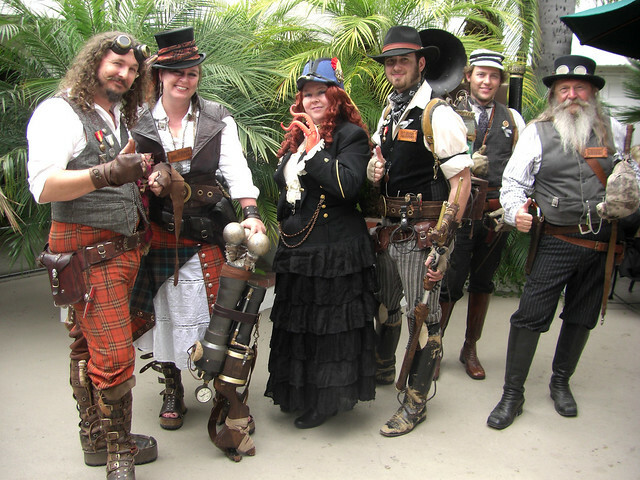 I went down to San Diego to attend Gaslight Gathering, southern California’s first steampunk convention. Conveniently for me, my copy of Morlock Night arrived so I had new… well recently reprinted reading material for the flight. I arrived on Thursday night so I could get a fresh start in the morning. 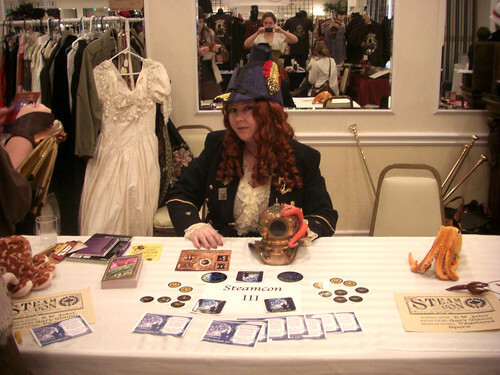 My main purpose was to run a promotional table for Steamcon III. I also had a few panels and one talk to give. The venue is a truly curious mish mash of former hotels, motels, convention facilities, restaurants and a spa that is now called Town & Country. On my way there I discovered that we were going to be sharing it with a swing dance convention as well as a few others. Luckily, it’s a big place, sort of an overly ornate rat maze for humans as it turns out. 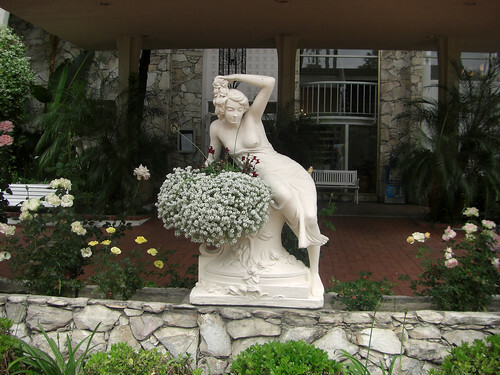 There were many gardens, trellises and gazebos scattered about as well as lots of quite random statuary. 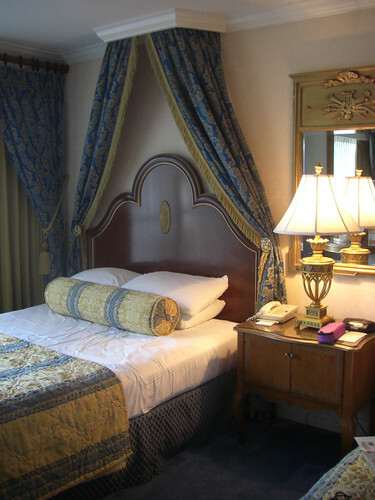 The room we stayed in was quite sumptuous. I did have the good fortune to ride the elevator frequently with many curious mundanes who were quite charmed and intrigued by my description of our gathering for the weekend. I suspect some of them dropped in on the festivities. On Friday morning, after a very mediocre breakfast at the Terrace Café, I investigated the convention space. The spacious merchants’ room was still getting set up and happily my Steamcon table was right inside on the right hand wall. Registration, due open at 10:00 A.M. did not open until after 11:00 A.M. as often happens the first year, but I got tech support for my talk “Steampunk 101”, which was to occur at noon. I feared that no one would make it since they couldn’t get registered in time, but I did have a small but enthusiastic audience, nonetheless. It went well and I later heard a few people comment that they really wished they could have attended. 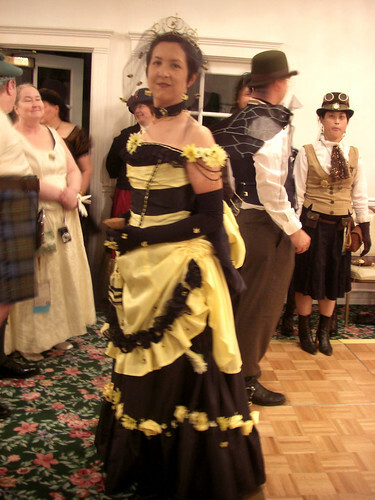 Afterwards, my roommates and I had a quick nosh and I went back to man my table and answer Steamcon III questions. I must admit that this review will be a bit incomplete due to my table duties which prevented me from seeing the entire convention. I bought a plushie octopus and a miniature brass diving helmet from a merchant in the room, which made wonderful table décor to go with Steamcon III’s 20,000 Leagues theme. At one point I ventured out to get officially registered and found the door to registration closed. I looked unsurely about and a spritely young thing asked what I needed. When I told her that I was a panelist, she flung open the door and pranced inside announcing my status. I was served promptly. The program book is lovely and Steamcon’s ad is right on the inside front cover. Sadly, there is a conspicuous absence of a map. The membership badge is ungainly, approximately the size of a flattened paperback novel and attached to a lanyard, which I find less than useful. I usually bring a spare clip to rectify this, but I had neglected to repack it. My badge had a blue ribbon stating “Second Class” and a red ribbon that said “Panelist” already attached. Anastasia, the fan table liaison came by and gave me a lovely little cloth insignia to wear. I also purchased one of their handmade Gaslight Gathering pewter medals which are quite fabulous. 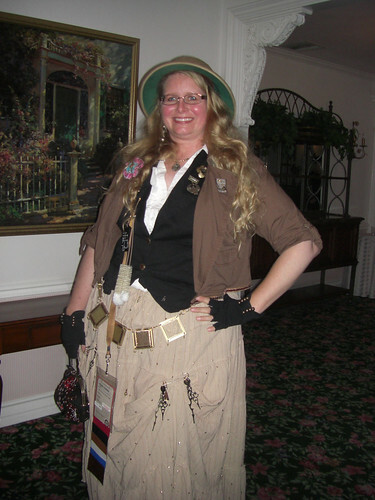 I spent the rest of the day talking up Steamcon and enjoying the enthusiasm of the attendees. Food that night was found by walking across a bridge to the mall. Dressed up as we were, we got a lot of strange looks and several inquiries. People were generally bemused. When we came back we checked out the dance. It was up a flight of stairs. The foyer was almost impossible to traverse due to all the photographers and their victims. Once through, we discovered that the entrance to the dance let out into the middle of the dance floor. This meant that the flow of traffic was blocked by new arrivals and once again … photographers. We chatted a bit, wandered a bit and finally decided to call it an early night so we would be fresh for the day. Saturday morning I went to the Terrace for breakfast again, and it was again fairly mediocre, but food is food. I wore my Nemo’s Daughter admiral outfit complete with tentacle fingers f or the day. It got lots of attention for the special effects and the hat. I sat at my table and was so busy promoting Steamcon III that I was a tiny bit late for my panel, which was down the courtyard, across a pool area, and up to the 9th floor of a neighboring building. The lack of a map in the program book was inconvenient and since it is the most confusing space, I think it might be a very good addition for next year. The panel was on faux finishes and it was very well attended. My fellow panelists were quite knowledgeable and the hour flew by. I think we could have gone on for a while, as we sort of did with random audience members afterwards. I think that appointing a moderator might be helpful as there is a certain amount of chaos if there isn’t one. Afterwards I ducked in to get my photo taken by “Tobias Eastman”, a professional photographer, since I was in the vicinity. While waiting, I got an opportunity to talk to one of my fellow panelists, Arabella Benson, who is an absolute delight and very creative. Later in the afternoon, I chanced upon the League of S.T.E.A.M. in the courtyard. I would have chatted longer, but they are just so popular it’s hard to deprive others of their awesomeness. 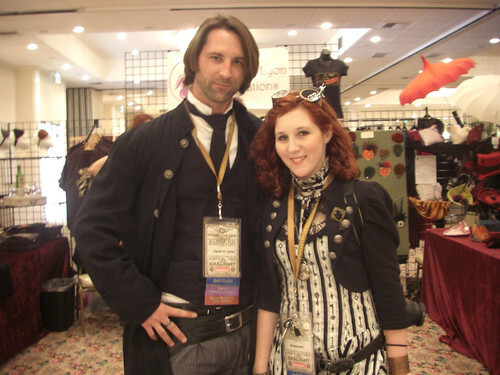 I did get to chat with Baron Von Fogel for a bit afterwards and we are already scheming for Steamcon III. Dinner was found at the mall again. The manager at The Art of Shaving called out to us as we passed and was very interested in our endeavor. He gave us some samples to take to our men. We didn’t have concert tickets, so we didn’t bother to check it out although I later heard good things about Steampowered Giraffe. The dance that evening was period dancing, which I am atrocious at, so I didn’t partake. One of my roommates did choose to stay and dance but after chatting with folks for a bit we wandered off to find more people to chat with. 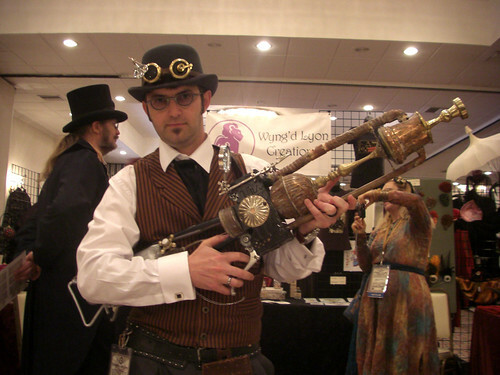 One never really lacks for entertaining people to talk to at a steampunk convention, and this one was no exception. We found the charming Anastasia and she introduced us to more folks. I talked myself hoarse, but that is nothing new. Sunday morning, third time’s the charm, breakfast was better. Or maybe you simply can’t screw up oatmeal? Due to having to pack up, move all my things to the table and check out, I decided not to dress up. I really hate being at a convention and not being dressed up. I just don’t feel like me. I had a panel on Thrifting at noon and then a panel I wanted to attend, so I knew I might be too busy to change. Once again, I was deep in conversation when time for my panel came. Luckily it was very close this time, so I wasn’t horribly late. It was a full house again and it seemed to go quite well. Arabella was there again and had a lot of show and tell, so I didn’t feel bad about slacking somewhat. Right after my panel, there was a talk I was very eager to see, so I rushed off. Gavin Scott, the creator and writer of the television series: The Secret Adventures of Jules Verne was going to be talking about it and showing some episodes. The room he was scheduled in was changed, so I took the opportunity to walk with him and introduce myself. I explained that I was a big fan of the show, had seen some of it when it aired and had done some casual campaigning to get it released on DVD. He was gracious and seemed pleased of the attention. 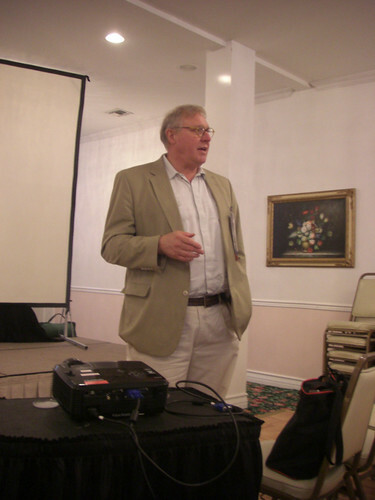 The panel was sparsely attended, but it was Sunday and not everyone is aware of the show. Rick Overton, one of the actors had been scheduled to appear as well, but had a family emergency, which I must say I was sad to hear. I am a fan of his comedy as well as some of his past roles. Gavin told us some of the history behind the show and then began showing episode 2. He gave commentary and took questions during it since the sound was very faint. To my deep chagrin, I really had to go and eat so I could not stay for the entire talk. I debated finding something quick and returning but I also had an obligation to go back to my table, so I did. Happily Gavin came and found me after his talk and gave me a copy of the newly released soundtrack, which I had him autograph. He showed me his book of clippings from the show. I wish I could have spent more time looking at it, but he did need to get going. I told him that in many ways I felt that show was ahead of its time. I mean think how popular it would be now, with all the steampunk interest. I always point to that show when someone asks if there is a quintessential steampunk show. 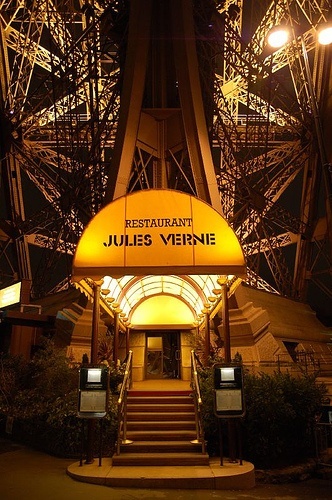 It even has Jules Verne himself in it! He seemed to feel that I just might be right. Maybe we’ll see something come of it. Meanwhile he says to write to Talisman Films and let them know you would love to get a copy on DVD. I know I’m going to write them. If they do put it out on DVD, I hope they take the time to create some extras and let Gavin tell the history behind it. After all, he was steampunk before it was cool. So that was a great end to my fabulous weekend. I met so many wonderful people. Saw so many interesting costumes and gadgets! I heard that they got three times the number of expected attendees, but it never felt crowded. It’s a quirky venue, but it works for our quirky crowd. Well done Gaslight Gathering crew! Book me on next year’s excursion! My photo gallery for the event is here.